Major James Patrick Sinnot Devereux, USMC, made one of the greatest defensive stands of the war beginning December 9, 1941 on Wake Island. On January 16, 1944 a Sunday paper in central NJ had a section called "This Week". It published the pictures and letter on this web page. My wife's Grandmother cut this one page out and saved it with her letters from the war in her files. Why, we have no idea, her husband was in England with the US Army. But, over 50 years passed and my wife came upon this article shortly after I spent a week on Wake. Amazing. 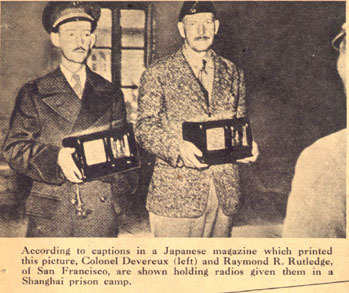 After the taking of Wake by the Japanese, Major Devereux, seen above in a Japanese propaganda photo, was sent to China to a POW camp. On July 23, 1942 his wife who was 27 died. 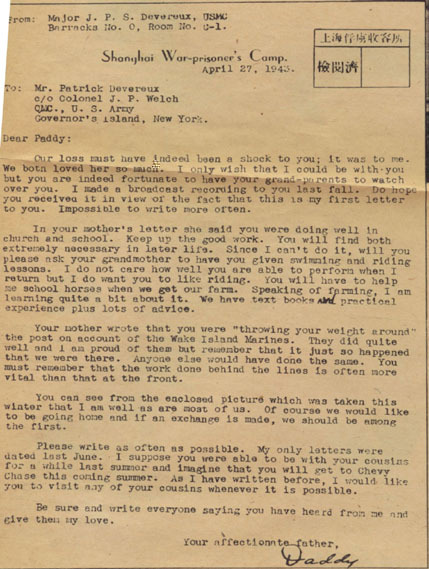 The letter below was sent to his son in an attempt to console him for the loss of his mother. It is a moving document as I'm sure you'll agree. 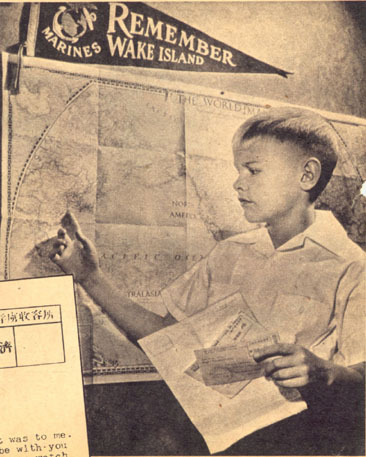 Also in the article is this picture of Paddy Devereux, then living in Burlingame, CA., shown looking at a map with the letter in his hand and pointing to Shanghai, China on a map. This page designed and maintained by N1DG.